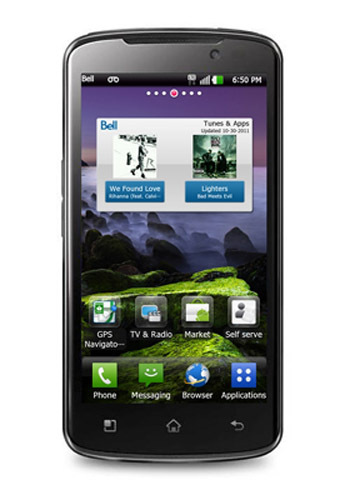 SEOUL, Nov. 9, 2011 — LG Optimus LTE, the world’s first HD LTE smartphone, will be available from Bell in Canada in the coming weeks. Bell is expanding its nextgeneration 4G LTE wireless network across the nation and has designated Optimus LTE one of its superphones. Since its release in Korea, sales of Optimus LTE has surpassed all of previous LG smartphones for the same period. The combination of 4.5-inch 1280 x 720 (16:9 ratio) True HD IPS display and 4G LTE connectivity ensures users’ enjoyment as the best quality multimedia device currently available. In addition to displaying sharp and crisp images with 2.76 million (1280 x 720 x 3 RGB) sub-pixels, True HD IPS display is superior in color accuracy, clarity, natural color and battery efficiency and provides the ultimate viewing experience for HD content. The Optimus LTE has a 1.5GHz dual-core processor and runs on the Android 2.3 Gingerbread OS platform, ensuring enhanced performance. With a 1,830 mAh battery, 8MP camera and multiple connectivity options, including HDMI and DLNA, this smartphone provides an ideal multimedia environment over a fast LTE network.